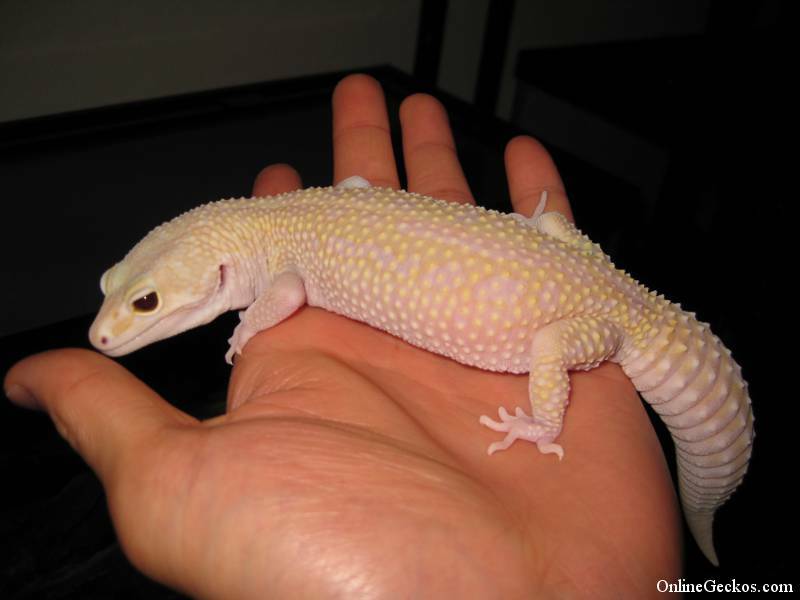 Leopard Gecko Care Guide - Caring for Pet Geckos - Leopard Geckos For Sale - Quality Gecko Breeder - Tremper - Bell - Rainwater - Giant - Mack Snow - Albino - Tangerine - Fattail of must have items that you have to purchase for your leopard geckos. But before we start, be wary of starter "kits". We have not seen one starter kit with adequate amount of items that are required for proper caring of leopard geckos. Many come with basking lights without an under tank heating pad, many come with just 1 hide. Most of them come with stick on thermometers that tell you the air temperature rather than floor temperature. You will save a lot of money by purchasing what you need individually, rather than buying a starter kit, then not use half of what comes with it because they are inadequate for leopard gecko's needs. We have done this calculation multiple times, it is far more cost effective to purchase individual items you need. Plus you would be providing your geckos with the best care possible, which should always be your #1 priority. Due to requests and feedback, we've included the links to purchase some of these items to make it easier for you. We purchase most of our gecko supplies via Amazon. With Amazon Prime membership, you get fast free same-day or two-day shipping. You also pay less because there's no retail markup. If you were to buy a Zoo Med Repti Therm 12"x8" from retail stores, you are looking to spend around $30. While on Amazon you can have one shipped to you same-day for free at around $16. That's half the price, just as an example. To us Amazon Prime is totally worth it, you can try it for 30-days free here. If you are a student with a .edu email address, you can get 6-months FREE Amazon Prime trial plus 50% off Prime subscription! This means Prime is only $49 for you, $99 for everybody else. You could cancel the trial membership before the trial is up and pay absolutely nothing. All the while enjoying the benefits of Prime membership such as fast 1-2 days shipping, unlimited video streaming, unlimited Amazon Drive photo storage, and more. 1. A 10 gallon long tank for 1 single leopard gecko, 20 gallon would be preferred for adult leopard geckos. You can start off in a 10 gallon tank for a hatchling or juvenile, but a 20 gallon long is really preferred as a minimum size for adult leopard geckos. A 20 gallon tank would give you better temperature gradient, and allow you to utilize more hides and decor. Your gecko would also appreciate the extra space. Remember to get the long type, not high. Leopard geckos do not have sticky pads to climb, so they require floor space, not height. A mesh top is highly recommended, they are great escape artists. You will be surprised at how high leopard geckos can jump. We love these all glass Exo Terra Terrariums. Front openings make accessing your geckos and cleaning so much easier. Cost: 10 gallon $40, 20 gallon $70 (estimated average cost in pet stores with terrarium mesh top setup, cheaper if you can salvage one and build your own. Some pet stores have $1 per gallon sales throughout the year,click here to check your local Petco ads for these sales) Exo Terra all glass terrariums cost more, but they are very nicely built. If the price suits your budget, we highly recommend them. 2. An under tank heater, or UTH. You will want to buy one that covers 1/3 of one side of your tank, so measure your tank and purchase the right size. Don't base your puchase on what the label says on the UTH. Too large will cause your tank to overheat, too small will not provide enough heat for your leopard geckos. The Zoo Med Repti-Therm is the most popular UTH brand, it's Amazon's #1 Best Seller. You can find them everywhere from online stores or local pet shops. For an example, Zoo Med Repti Therm under tank heating pad has one labeled as for 10-20 gallon (8"x6"). But the next up size (12"x8") is more suitable for a 20 gallon long 30x12x12 tank. So if you have a standard 20 gallon long, I would recommend the Zoo Med Repti Therm pad that's 12" x 8". 3. Digital Thermometer with probe. You can find them from online stores or in local pet shops. Brands don't matter, they mostly work the same and are perhaps the same design but re-branded on the outside. The reason you want a digital thermometer with a probe is to be able to test your terrarium floor properly. It's not the air temperature you want, that's what those stick on thermometers will show you. You want to know how hot it is where your leopard geckos will be laying on. There are also temperature guns that make testing temperature easy, such as Etekcity Digital Laser Infrared Thermometer. You just point and click. It's a life saver when you have multiple tanks. 4. Substrate. We highly recommend buying slate/ceramic tiles from your local Homedepot/Lowe's. They are a bit over $1 per 12x12 piece, and they will do you for life. They are easy to clean, easy to keep clean, natural looking, they conduct heat very well, and they have absolutely zero impaction risk for your geckos. Make sure to measure your tank before purchasing them, some stores will cut them for you for a price. The other cheap route is to simply use paper towels. They don't look as good as slate tiles, but they work, and they are easy to clean. There are people that prefer repti carpet, but repti carpet will end up costing you too much as they are at least $10 per piece, and you will likely want to buy multiple pieces so you have one to use while you clean & air dry the other one. They also don't last forever. Repti carpet also get dirty and messy quick, and they are not as easy to clean since the carpet traps bacteria and waste. The little loops in the carpet are also known to cause your leopard gecko's teeth or toes stuck at times. We do not recommend sand or other loose substrate as they can cause your leopard geckos to get impacted. To lessen the risk of impaction, you should go with either tiles or paper towels. For moist-hide substrate, we recommend coconut fiber. You can purchase a brick such as Zoo Med's Eco Earth. It will last you a very long time. We do not recommend using this throughout the whole tank because again, loose substrate could cause impaction. Also covering the whole tank floor with coconut fiber will increase the humidity inside the tank. Persistent high humidity can cause upper respiratory infection in leopard geckos. 5. Vitamin supplements. You will need to purchase multivitamin and calcium powders for your leopard geckos. There are many ways to supplement but a common method is to purchase calcium without D3 (phosphorous free) powder and leave it in a bottle cap or dish inside the tank at all time. Leopard geckos will lick them when they need calcium. You can find them under Zoo Med, Rep-Cal, and Repashy brands just to name a few. We use Zoo Med Calcium without Vitamin D.
Then purchase a multivitamin supplement to dust your feeders with prior to feeding them to your leopard geckos. For multivitamin supplement, we recommend Repashy Calcium Plus and Zoo Med Reptivite with D3. Either one of these should do you fine, both are good quality brands that make great vitamin/calcium supplements for reptiles. You can purchase these in most local pet stores as well as online retailers. The reason you don't choose calcium with D3 to leave in the tank is because free-feeding calcium with D3 could cause D3 overdose. Too much vitamin D can be toxic to your geckos. This is why for calcium to leave inside your tank for free-feed, you should always pick calcium without D3. Then for dusting purposes, pick multivitamin with D3 because you can control how much you dust. You can read our comprehensive guide on leopard gecko multivitamin supplement needs on our blog page for more details. Now that the must have's are done, the check list continues for optional & recommended items. 1. Hides, your leopard gecko will require 3 hides. A warm hide, a cool hide, and a moist hide somewhere in between your warm & cool side. You can purchase good looking hides, practical hides, make your own hides, or you can simply turn deli cups upside down and create cheap on the go hides. One of the cool hides we love to use is Fluker's Castle Crib Reptile Basking Platform. It somehow fits perfectly in a standard 30x12x12 tank, plus it serves as a hide, a platform, and a water dish. So while the hides are not optional, because your leopard geckos require them. The cost is completely up to you what you want to spend. You can deck your tank out to be as pretty as you want to. Many leopard gecko owners like to build "themes" within their terrarium setup. Part of the fun to owning leopard geckos is to decorate their tanks. But when it comes down to hiding spots, your leopard geckos won't really care what you use as long as they fit and work well. Remember leopard geckos like tight fitting spaces where they can feel secure, not large hides with multiple open holes that we can peek into. For moist-hide substrate, we recommend coconut fiber (Eco Earth) or wet papertowels. Eco Earth is also great for female leopard geckos as laybox substrate. 2. Thermostat, if you want peace of mind, get a thermostat to regulate your under tank heating pad's temperature. UTH is known to get too hot, even more so if you use paper towels as substrate as it's very thin. Having a thermostat will allow automatic monitoring of the warm spot inside the tank, and it would shutoff your UTH when it gets too hot. It is highly recommended for all hobbyists to use a thermostat. There are two types of thermostats, a proportional and a non-proportional thermostat. Non-proportional thermostats will shut off your UTH when it gets above a set threshold. Proportional thermostats on the other hand, will keep your UTH on but they simply lower the power output to your UTH to regulate the heat. Proportional thermostats are more expensive than non-proportional ones, they are usually used by breeders. Both should work fine for you. You combine the UTH with a thermostat, you can leave them on 24/7 365 days a year, and be completely worry free. This is different from rheostat, as rheostat is like a light dimmer. It will not monitor the heat since you have to manually adjust them. So if your UTH overheats, rheostats will not shut it off. Hydrofarm Jump Start MTPRTC Digital Thermostat is Amazon's #1 Best-Seller, with thousands of positive ratings. We recommend this for all gecko hobbyists. You won't find a digital thermostat with these features & digital readings at a lower price. Definitely nothing that compares to its reliability and positive reviews. 3. Red/Moonlight bulb for night viewing. Leopard geckos are crepuscular, so they do not require light during the day or night. But since their most active hours are during night time hours, you obviously would like to observe them when they are out and about. Red or Moonlight bulbs generally do not bother leopard geckos, so you can safely use a low wattage bulb for night time viewing. Also standard ambient light in the room won't bother them, just as long as you are not shining a direct light on their tank. So a red or moonlight bulb is completely optional. We prefer moonlight bulbs because they imitate natural moonlight, so it's more natural for them. Some used to think leopard geckos can't see red light, but it's untrue, they can see red light. If you choose to provide night light, make sure to get as low wattage as possible because you are not trying to heat their environment. High wattage night lights will raise the temperature a bit too high. This won't be ideal unless you live somewhere cold where temperature drops sharply at night. 4. Fun Decor. There are fun decors you can add to your tank. They'll add flavor to your tank, and your leopard gecko will appreciate having additional items to climb/lay on. We've seen gecko hobbyists utilize reptile hammocks successfully. There are standard mesh-made reptile hammocks such as Zoo Med Mesh Reptile Hammock and Zoo Med Giant Hammock. Then there are 100% natural seagrass fibers hammock like Penn Plax Lizard Lounger. Some geckos really love to climb and lay on them. Although your mileage may vary as some geckos don't care for them. You can try them to see how they'll work for your leopard gecko. We are just giving you ideas and let you know what have worked for some gecko hobbyists. You can also put some greens in your tank to add color. Feel free to check out our Basic Tank Setup guide for a visual of how your terrarium can look like. Male leopard geckos must not be mixed in with other male leopard geckos in the same tank. Male leopard geckos are very territorial, they will fight for living space and cause injuries to each other, sometimes even death. Female leopard geckos can be housed together given that there is plenty of room for each of them, and that the females are similar in size. We do not recommend putting more than 1 leopard gecko in a 10 gallon tank. For 20 gallon long tanks, you can successfully house 1-2 adult sized females without a problem given proper number of hides for each of them. Of course when it comes to the size of terrariums, bigger is better. 40 gallon+ tanks will give your geckos more roaming space, better temperature gradient, and it'll allow you to utilize more hides, foliage, and decor. Please remember that while females generally get along, there are times when you have a feisty female that just won't play nice. So it's very important to observe your females especially during feed time. Anytime you notice any bullying, any injuries that just show up one day on one of your geckos, or anytime you have a gecko that just stops eating altogether...these are all signs that tell you that you should separate your females right away. Leopard geckos are really solitary creatures, they prefer living alone. So keep that in mind before you introduce a new gecko pal for your existing gecko. They may tolerate each other's company. But they simply thrive better when housed alone, and are generally more healthy as a result. One male can also be housed with 2 other females in a 40 gallon tank. But only do so if you intend on breeding. And before you look into breeding, please consider the cost, consequences, and long term care for the hatchlings in case you can't sell them. They are living creatures, please do not think about breeding if you can't afford proper care, proper housing, and unexpected vet cost. Also egg production is very draining on the females. Don't house male and females together for fun because the females will likely be exhausted. You could shorten their lives by forcing them to reproduce every year. Generally we recommend housing males alone. Females can be housed together as long as they get along. Also don't forget to do proper quarantine whenever you get a new leopard gecko. Quarantine means you leave the new leopard gecko in its own tank, away from your existing geckos. You would do this for a period of 60 days to observe the new leopard gecko, making sure the new gecko is healthy and does not get ill. Many new hobbyist make the mistake of mixing new leopard geckos with their existing geckos right away. Then later on they find that the new geckos have brought in new disease or parasites, and end up racking up huge vet bills or even lose their whole gecko stock. Quarantine is very important, do not look at it lightly. The warm side of the tank should be 88-93 degrees (F) on the tank floor. The cool side of the tank should be your room temperature, which should fluctuate between low 80's during the day, or low to mid 70's at night. If you notice your temperature drop below 70 at night on a consistent basis, you will want to purchase a ceramic heat emitter. Ceramic heat lamps will emit heat without light, which is ideal for your leopard geckos. Use this only if the room gecko is in falls below 70 degrees Fahrenheit on a consistent basis. Ceramic heat emitter (or CHE) can get very warm, so use it with caution. Leopard geckos need to have a cool area to sleep in, so do not overheat your tank. You can adjust the height of the ceramic heat emitter; the higher they are above the tank, the lower the heat output inside the tank. Make sure you purchase a digital thermometer with a probe or temperature gun to properly test your temperature. Remember it's not the air temperature that's important, it's the floor temperature where your leopard gecko will be laying on that counts. Leopard geckos absorb heat through their belly, not their backs. So contrary to popular belief, they do not require a basking light. Proper belly heat will ensure they can digest their food properly. Those stick-on thermometers that often come with retail kits are not ideal as they only tell you the air temperature, not the floor temperature. The humidity should be between 20-40%. They are arid creatures, so they do not require high humidity. In fact persistent high humidity can cause upper respiratory infection. But a moist hide is required to allow them to shed properly. Remember of the 3 hides you need, moist hide is one of them. You should place this moist hide somewhere between your warm & cool side, preferably sitting on top of a warm spot. A popular method is to sit the moist-hide half on the warm spot, half on the cool spot in the tank. It should contain either wet paper towels or coconut fiber. Moss is used by many as the moist hide medium, but we've seen many cases of moss impaction. We do not use moss here at OnlineGeckos.com. For males we use wet paper towels, for females we use coconut fiber as their moist hide, which is also used as their laybox during the breeding season. Read our comprehensive guide on leopard gecko temperature & heating requirements, along with under tank heating pads installation guide here on our blog page. Leopard geckos do not have any special lighting requirement. Leopard geckos are crepuscular, they are the most active during fading light around dusk & dawn. You'll notice in the early mornings, your geckos are out roaming around, looking for food. But then they will sleep through the day, until later in the afternoon when they wake up and start roaming around again. This is their normal daily cycle in captivity. As we've mentioned prior in this guide, retail kits are not ideal for your leopard geckos. The items they include in retail kits are for general reptiles, they rarely differentiate the needs of diurnal species vs crepuscular species. And from what we've seen, most of the retail kits lean toward diurnal species such as bearded dragons & iguanas. Hence why they often include UVB bulbs, light domes, stick on glass thermometers, 1 hide, and sand-type substrate. In order to provide the best care for your leopard geckos, you should follow this guide and purchase equipment separately. To provide vitamin D3 to your leopard geckos, you should be gut-loading your feeders and dusting them with a multivitamin supplement such as Repashy Calcium Plus or Zoo Med Reptivite with D3. Proper gut-loading and supplementing are key to keeping your leopard geckos healthy. No basking light is needed during the day, and at night leopard geckos navigate just fine via ambient room light. We recommend Rainbowmealworms for your feeder needs. Good prices, fast shipping, and great selections. Get a 10% off Coupon on your next order at Rainbowmealworms here. When you click on the link to Rainbowmealworms, a window will popup on the lower left hand side of your screen. Simply sign up with an account and make a purchase, you'll be able to utilize the 10% off coupon with your order. Leopard geckos are insectivores, they do not eat any veggies. Things you should feed your leopard geckos include, but not limited to, crickets, mealworms, superworms, dubia roaches, waxworms, silkworms, phoenix worms, hornworms, butterworms, etc.. Young leopard geckos should be fed once or twice a day. Adult (1 year old+) and sub-adult (8-12 months old) leopard geckos usually eat once every 2-3 days. Leopard geckos do most of their growing during the first year, that's why they eat more when they are young. You should feed them as much as they will eat within 15 minutes, then take out the rest of the food so they do not bug your leopard geckos and stress them out. As for choice of feeders, that is totally up to your personal preference. The only one we would not recommend utilizing as a staple diet are the waxworms due to their high fat content. There are successful breeders that have fed mealworms as their staple diet. While others, like us, feed a variety. We keep mealworms, superworms, and dubia roaches on hand. Every other night the leopard geckos are fed something different. This variety we believe will provide your leopard geckos a more balanced diet. It also trains them to not be picky eaters, because you never know when you may run out of a feeder type. Nutrition wise, dubia roaches (Blaptica Dubia) provide the best nutrition when properly gut-loaded. They have a higher protein value (23.4%!) than other feeders, less fat (7%), and their exoskeleton is easier to digest than mealworms/superworms. They also have larger digestive tract, thus what they eat goes inside your leopard gecko's stomach. Dubia roaches are also easy to care for, they live quite a long time in room temperature given proper food and water. They also don't smell, they can't climb smooth walls, and they don't jump or chirp like crickets. So if you can train your leopard geckos to take on dubia roaches, you have it made. Dubia roaches are what we prefer here at OnlineGeckos.com. We went through the pros and cons of each feeder insects on our leopard gecko feeder nutrition guide. Be sure to check it out. Buying feeders in bulk can save you money in the long run, especially so if you have multiple reptiles at home. Most of these feeders can be fed readily to any reptiles, not just leopard geckos. A good place to buy feeders in bulk is on Amazon, since sellers are often competing against each other which could result in lower prices. We've found some good prices on bulk superworms, mealworms, crickets, dubia roaches, waxworms, and hornworms. Whichever feeders you choose to feed your leopard geckos with, make sure you properly gut-load them. Gut-loading means your feeders are fed a high vitamin & nutritious diet 24 hours prior to you feeding them to your leopard geckos. You are what you eat, the same goes for your leopard geckos. So the more nutritious and well fed your feeder insects are, the healthier your leopard geckos will be. Popular items used to gut-load are fresh veggies and fruits. Do not use dog/cat food, there are too many preservatives, fillers, and chemicals in dog/cat food. Plus dog/cat food are often too high in protein. High protein diet will cause dubia roaches to have uric acid build up in their system. Excess uric acid will cause your leopard gecko to get gout. Stick with fresh veggies and fruits whenever possible. It's worth noting leopard geckos get most of their moisture needs through the feeders they eat, as they don't drink water often. By gut-loading your feeders a day before, you ensure the feeders are properly hydrated and full of moisture. Remember to always take out leftover feeders that your leopard geckos do not eat, especially if you use feeders that roam the tank like crickets. Crickets are known to gnaw on your leopard gecko's soft spots like their toes. They can cause stress and injuries to your leopard geckos. Crickets also are known to eat leopard gecko waste. What happens is once crickets have ingested gecko feces, they may have ingested parasites or oocysts. Then your leopard gecko goes to eat the crickets, and thus your leopard gecko have just ingested parasites from the crickets. So always take your leftover feeders out, do not leave them free roaming overnight. If you have leopard geckos that are not as agile and seem to miss crickets and dubia roaches often, you can help them out by pulling the hind legs off your feeders. This is a common method leopard gecko owners use to help their geckos catch their prey. Crickets can jump high and far with their hind legs, dubia roaches can run pretty fast as well. Pulling their hind legs off will greatly slow their movement down, but they will still run thus they should still stimulate your leopard geckos. A clean water dish is required in the tank at all time. These Exo Terra water dishes are nice because its nonporous surface prevents bacteria buildup and absorption. Water should be changed every 2-3 days. We recommend using mountain spring water for your leopard geckos. It's one of the most pure forms of water without the added chlorine and contaminants found in tap water. Zoo Med Stainless Steel Feeding Tongs are great when it comes to feeding your geckos. They make reaching for insect feeders easy, and they clean up well. It's also more sanitary since you won't have to touch the feeder insects. Also get yourself escape-proof feeding dishes such as OMEM Ceramics Made Worm Dish. Smooth surface and inwardly curved walls make them perfect dubia roaches & mealworms escape-proof feeding dishes. To learn more about leopard gecko feeder insects and their nutritional values, take a look at our leopard gecko feeding feeder insects guide. You should purchase calcium without D3 (phosphorous free) supplement and place the powder inside a dish or bottle cap, and leave it in the tank at all time. Your leopard gecko will lick it as it needs calcium. In addition, you need to purchase a multivitamin supplement to dust your insects with prior to feeding. Either Zoo Med's Reptivite with D3 or Repashy Calcium Plus will work great as the dusting vitamin supplement. What you would do is to take a sandwich bag, place some multi vitamin powders in it, and put the insects you want to feed inside the bag. Close it up, then shake it around to make the powder stick to your feeders. This is what they called "shake and bake" method. You will want to dust your feeders at every feeding with multivitamin. Calcium in the tank is purely optional. Just make sure if you choose to provide calcium in the tank at all time, that they are calcium without D3. The required part is the multivitamin supplement, this is not optional. For a leopard gecko to be long living and healthy, it's essential to dust your feeders with multivitamin supplement. You should pickup your leopard gecko waste often. This will make sure your tank does not smell. For the corner where your leopard gecko defecate in, you can simply place a piece of paper towel there and just change the paper towels whenever they defecate. If you use slate tiles, it's very easy to spot clean whenever you see fit. Normally once every 4-5 months you will want to take everything out, including your leopard gecko, and totally clean and disinfect your tank and the items inside the tank. But generally leopard geckos are not messy creatures. They are very easy to take care of and easy to keep clean. For daily rinse/sanitizing, warm water + anti bacterial soap should do the job. For larger cleaning & disinfecting, we recommend using Chlorhexidine. It's non-toxic, and does not leave a foul odor. It's strong enough to kill many bacteria, viruses, and fungi. It does not however, kill crypto, giardia, and coccidia oocysts. If you have a parasite outbreak, suspect your gecko is sick, or have a gecko die and wish to disinfect the tank totally, then you will need to use Ammonia. Ammonia is the only disinfectant that's effective in killing crypto, giardia, and coccidia oocysts. You can read more information regarding disinfectants here, and here. There is also a very good GeckoTime article that everybody should read. Leopard geckos can carry salmonella as well as various bacteria, viruses, and parasites. Always wash your hands thoroughly with warm water and anti bacterial soap after handling your leopard geckos and live feeders. We often do a good job keeping their environment clean, but sometimes we forget the small things ourselves. It's very important to wash your hands thoroughly and often. Do not play with your leopard geckos while eating food. Do not allow your leopard geckos to walk around where you will be preparing food. We love them as pets, but there are some basic sanitary practices we should follow so we don't end up sick. If you get sick, who's going to be taking care of your leopard geckos? This is a very common question leopard gecko hobbyists have. Your leopard gecko has stopped feeding on a regular schedule, and you are wondering if there's something wrong. We've dedicated a whole article on our blog page to help you solve this mystery. Please have a look. 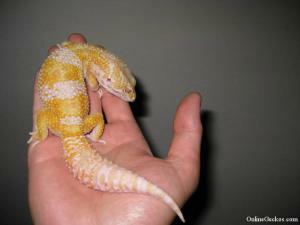 One of the most commonly asked questions is "when can I start holding my leopard gecko?". My answer is "depends, with patience it'll be sooner than you think". If you have just brought a new leopard gecko home, or one just arrived via shipping, you will want to give them time to adjust to their new environment. They are scared, confused, and stressed. So it's best not try to handle them right away. Allow them time to settle into their new tank, and allow them time to get used to you. They see you as a predator, so attempting to hold them right away can really stress them out. What you want to look for is when they stop hiding and running away when you approach the tank. It will come, you just have to be patient. Once they get used to you being the "food person", they will stop hiding and running, and they should start becoming more docile towards you. When they stop being afraid of you, that's when you should start with the basics of laying your hand slowly inside the tank. Lay your hand flat, and allow the leopard gecko to get close to your hand and lick you. Let them approach you first to establish that trust. Once they start to get used to your hand, you can then slowly attempt to scoop them up from the side of them. Do not approach from the back or above, they often get spooked if they don't see your hand first. And do NOT pull on their tails or they may cut it off when they feel threatened. Remember younger leopard geckos, especially babies and young juveniles, are very skittish. So it's possible they will try to run and even jump off your hands. If you are attempting to hold them for the first time, stay low to the ground just in case they decide to make that jump. You don't want them to hurt themselves. Also make sure to close your doors and any openings where they may run out. They are fast little creatures when they decide to make a run for it. Most first time leopard gecko owners are not prepared to handle them properly right off, you don't want to lose them so quickly. Just remember to take it slow, not all leopard geckos enjoy being handled. Leopard geckos generally get more docile as they get older. But if you have patience, time will come when they will lay on your bed or sit on your shoulder without you having to worry about them. 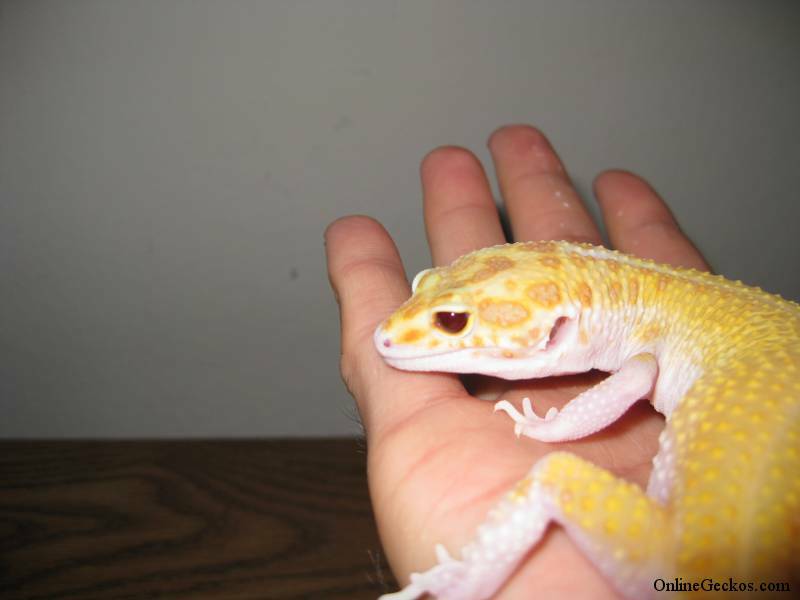 Leopard geckos are great pets that will be with you for a long time if cared for properly. 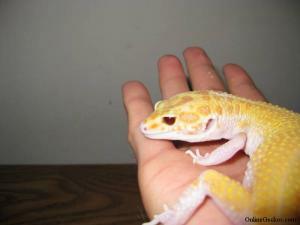 Why support and buy from leopard gecko breeders? Leopard Gecko Wiki - Great source of morphs, history, and health related articles. Leopard Gecko Morph Calculator + Apps - A new leopard gecko calculator from lovegeckos, very nice looking, and they have apps for iphones & androids.